I made good progress on the Bonnie Hunter-Double Delight mystery quilt this week. I managed to get my body off the couch about nine o'clock last night and finished sewing the rows together. I'm thinking that I don't want to use a pink for the setting triangles, so I think I will need to head out to Sweet Home this morning....so sad! Peggy called yesterday and she has finished the quilt. It is the brights with a Laurel Birch backing-cats and presents. I can't wait to see it. Can't go too early to pick it up because Peggy sleeps later than O dark thirty. I am going to drop off another project for her to work on as well. I did so well last year finishing projects but this year...not so much! Also have to get ready for tonight!!! I need to find a project for the girls to work on besides watching movies. We get to watch the Clifford movie again-one of their favorites. I like it too. Only problem is that I only watch movies when they are here and It takes me awhile to figure out how to work the CD thing every time. I am, after all, electronically challenged! This afternoon after work I finished putting the last of the blocks needed to construct Double Delight. Now I have to begin making and sewing the rows together. Also have to cut the setting triangles. I am liking the way this top is coming together but I don't know what I will do with it once it is finished! I am so glad that it is already Thrs. and there is only one day left in the work week. Don't know what is on tap for the weekend. But we are having a sleepover on Saturday with my best little girls. Sue and I also have to do some work on the quilt for her school as well. I have to get going on that one. The Evil Temptress sent an email this week and something from her just pooped up on the screen. I might just have to make a run to Sweet Home! And now I feel it is time to spend some quality time with the couch! How bad is that?? Thimbles was wonderful today although not nearly long enough and now it will be another month until we meet again...but..
Gretchen had this great idea. Since there are golf communities and such, why not a quilt community? What a great idea. Some time ago, my friend Louise and I talked about that as well. A space where you could have your own place and then a common area where you could go to do whatever. Kind of like a giant wheel with individual areas with a kitchen, sitting area, etc. and then in the center would be the giant quilting area. There would be access to shops and fabric, field trips and such...catering for those of us who detest cooking and of course someone to clean the house...more time for sewing! So someone figure it out and make it happen!!!! I worked on Double Delight today but I think I miscounted pieces because I seem to be short of the one block, I need to make some more or perhaps check in the sewing room to see if I have all the completed blocks together. Also worked on the project from last month but I think the strips are multiplying because I still have so many to sew! I did manage to send my swap off to Australia this morning and now I need to go do some boring stuff like laundry! It is only one day out of the month and I so look forward to it! Today I can head over to Grayson and spend the day with the other thimbles/sisters. Am not quite sure what I am going to work on today. I have not done very much on last month's project, so I can work on that...or there is the Double Delight-Bonnie Hunter quilt top-that needs work. 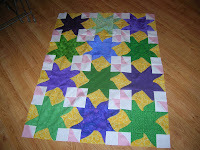 I have to make about 24 more blocks on that before I can start sewing the rows together. I want to make the little bag that is in the sweet roll box I bought and then there are other projects too....so little time, so many projects. 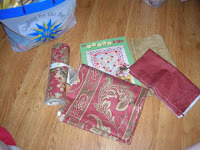 I am hoping once the weather warms up that I will feel inclined to sew some during the week. Right now all I want to do is hibernate on the couch. Honestly, I was there by 6PM last evening and hardly moved until I went to bed after 11. I have the package ready to send to Australia today for the swap. I will stop at the post office before going to Thimbles. Hopefully it will be a quiet, dull weekend with just the usual stuff to do. I hope other sisters will check out the new store as well. We need all the quilt shops we can get and need to support our sisters in their endeavors. Then I came home.....and did pretty much nothing! 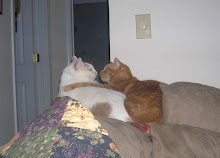 The couch is again calling me and Spiff and Henry are looking for company on the couch as well. Spring here in the Atl brings some wonderful things BUT it also brings the threat of tornadoes. i knew yesterday when I left work that it would probably not be a very good night for some as the temperature was warm. Sure enough when I arrived home and turned on the tv, the weather boys were on 11Alive. It made me think about last year when the tornadoes kept marching thru Alabama one after another. So that was last night-on the couch, under a quilt with the boys watching tv and dozing...not a productive night for sure. I think I will try to swing by the new quilt shop after work today. After reading Becky's blog. It looks really nice. And there is a finished Double Delight which I would like to see. I am not making much progress on it. But this Saturday is Thimbles so maybe I can work on it. I also have the January project which is not far along as well. Compared to last year, I am really being a lazy slug! I got the name of my fat quarter swap person on Saturday. She lives in Australia. I am trying to think of something "Atlanta" to include with the fat quarters I will send her. What fun! I also had to go on Wikopedia to see exactly where in Australia she loves. I must confess, yet another place I know little about! Emma's birthday party was yesterday at the Little Gym. Mots of little kids. I watched! The weekend went way to fast. But on the up side, one day down and four to go and then it is the weekend again. The upcoming weekend is a Thimble weekend so that is something to look forward. When we were at Sweet Home on Saturday, Sharon Brown Adams was there and she told me about a book she was reading that she enjoyed. I found it at Target yesterday and decided I would get it. It is "Still Alice" by Lisa Genova. The protagonist is a fiftyish woman who discovers she has early Alzheimer's. I sure hope it doesn't completely push me over the edge!!! What is sweeter than chocolate and better than a dozen long stem roses? 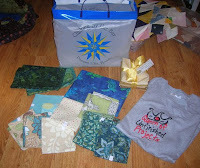 For me I guess one of my other addictions, not the chocolate one, Sweet Home Quilt Co. Gretchen had emailed me earlier in the week that she was feeling the need for a Sweet Home fix and was I interested too. 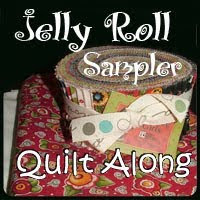 One does not have to ask the jelly roll junky twice! Cindi and I had planned to get together to sew today, so I emailed her and asked what her about her thoughts. Well it seems we all have the same addiction to Sweet home and so we will head out there when she gets to my house. Laurie is mortified that I have a facebook site. It didn't seem to bother Sue and she has agreed to be my "friend". Laur is not too sure! She needs to blame Kathy M! I really like my blog site better because I can ramble on and the world does not know that I am "impaired". Glad the work week is almost over. I am oh so ready for the weekend and even round 2 of the birthdays. I think it is Sunday-I guess I will have to check on that with Miss Emma. Finished the book "Guernsey....." I really did enjoy it and was sorry it came to an end. 1-I am a confired fabraholic and I have the stash to prove it! 1- Sweet Home Quilt Co. Okay, Gretchen now I am done. (Also Brenda tagged me) I have no bloggers to tag except Cindi...so your on! She blogged about a fat quarter swap. Darci in California is hosting the swap. Check out her blog: stitchandscissors@blogspot.com Hopefully I got it right. I am in-I think I have some fat quarters that fit the bill! One of the things I intended to do when I ran away to Fl last week was read. I bought 2 books (being very optimistic). However, I did not read a page. Yesterday, when I got home from the Diva Party in Alpharetta, I picked up one of the books. The Guernsey Literary and Potato Peel Pie Society. I think I first heard about this book on Becky's blog or maybe Brenda's. At any rate, I am finding it quite enjoyable. It is an easy read and although I am not that far into it yet, I like the character development. I must acknowledge ignorance of the Channel Islands and the German occupation. Maybe that was not covered in world history back when I was in school...or perhaps it was one of the days when I was daydreaming! On another note, I figured out the photo dilemma yesterday...hope I can remember it the next time I need to do it! Sarah's diva party was wild. I just kind of hung out on the sidelines. Laurie and Kris participated in the mayhem. I thought about going to the mancave and hanging out with Rob but then again.....Am I just too old for parties??? or just 7 year old parties??? She also told me that she is bringing Lilly up here for a get aquainted visit soon. The boys will be thrilled when that happens. Henry (who is right now sitting on my lap) just gives me that pained expression that says, "why Mom do we have to deal with another dumb dog?" Progress so far-there are a couple of more photos but I need to figure out how to resize. The weather guys on 11Alive are promising that the weather is going to moderate and we are going to have temps in the 60's. I sure hope he is not toying with me because I hate this cold weather. Henry also hates it and has been spending a good deal of his time under the quilts. He is always under the covers in bed too! So what is on tap for the weekend. I have lots of projects to work on. 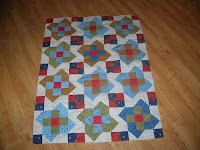 The mystery quilt from last weekend needs borders-still don't know what direction I will be going in on that one. 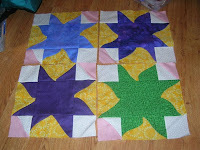 I have lots of blocks to do on step 2 of the Double Delight project. And then there is the honey bun roll and pattern I bought on the last trip to Sweet Home. I did laundry last evening and the house got cleaned on Monday so I don't have much to do in that department, just change the sheets and throw them in the machine. 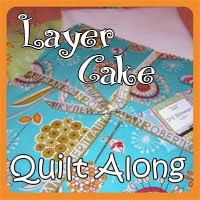 My friend Brenda is celebrating her birthday month with a giveway...check her out at the Quilting cowgirl. Bad Melisa is considering a tatoo for her birthday. Just another midlife thing, I guess. I spent four days trying to talk sense into Peggy Barkle who wanted a piercing on her eyebrow. She went as far as to go into this dive in Florida to check on the price. She called it her "rage against the man". I still don't know what that means. I had visions of this half swollen shut eye driving back from Fl. Common sense prevailed, as least temporarily. At any rate, go girls!!! The wind is blowing and the temperature is dropping tonight. I am so tired of winter I could scream. What did I do when I loved in NY and winter lasted until mid April? But that is beside the point because that is why I moved south-to escape the cold! I come home and put on my fluffy bathrobe right over my clothes. 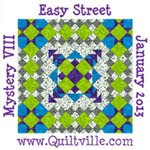 I finished construction of the blocks of the mystery quilt from the retreat. I will sew them together and think about the borders. I have a thought already but I will have to see what it looks like and then decide. I am glad that this is a short work week because man was I tired at the end of today....three more days until the weekend!! This weekend will celebrate Sarah's #7 birthday. She was 7 on the first but the party is next weekend and then the following weekend is Emma's fourth birthday. Nothing much new-guess I will go veg with the guys. I have been forgiven (or they are cold too)! 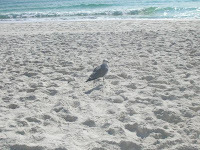 Various beach pictures and seagull picture. He/she was looking for a handout but it didn't happen. It would have been truly paradise if it was just a tad bit warmer! 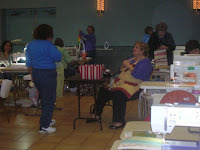 Check in was Friday at noon with free sewing in the afternoon. Lug in all the crap and set it up. I spent the afternoon finishing up the one block on the Double Delight mystery quilt. Then I began to cut step 2. I jumped over this step because it was more of step 1! Dinner was in a separte room. The quilt shop did the cooking. I wonder if they deliver? 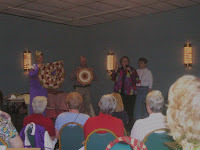 Friday evening was the lecture by Peggy Barkle on the journey of a quilter. She rocked the house. By the end of the lecture, I think there were several that wished they had signed up for her workshop. I did not give up my spot!! Forgot about the sunset...it was gorgeous. 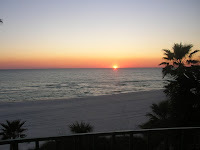 We watched the sun sink into the Gulf of Mexico. I have already posted that picture. After Peggy's lecture, I puttered a little longer and then headed back to my room. I was really chilly and there was no blanket on my bed. It fianlly occured to me to turn the heat on and then I was okay. I woke up in the middle of the night-all the lights on. I guess the heat had not been turned on in a while as the floor around the unit had all kinds of black flaky stuff...yuck! Saturday morning was the workshop. 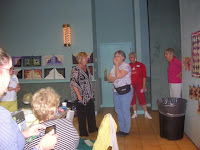 There were 3 workshops going on: Peggy doing blendable curves, Pat AKA Most exhalted Thimble doing her How does your garden grow and a lady from Fl named Sunnie Malesky teaching one of her designs. The lighting in the facility was AWFUL. I am so glad I had my Ott lite. Peggy's class area was a little tight with all the people in the class. Otherwise the area was okay. The shop had brought some stuff over as well so you could go shopping if you wanted to. After dinner was the mystery quilt. It is an orignal pattern by Sunnie. In the beginning, I had a really tough time but I think it was because I was tired. My table partner and I finally figured out step one. And actually it is a nice pattern. I was able to finish 2 blocks before heading back to bed. Forgot about Peggy's class. I am working on Curvasy Stars. I have completed 4 so far. It is quite freeing to not worry about quarter inch seams. I actually cut the curve freehand! Sunday morning was breakfast and then Pat's lecture. By the I was exhausted keeping an eye on her!! Then pack up and head home to sleep in my own bed. I did not add these pictures in the order I wanted but ...oh well! 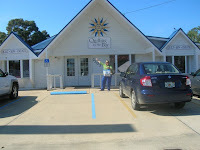 The shop responsible for the retreat was Quilting by the Bay in Panama City, Fl. 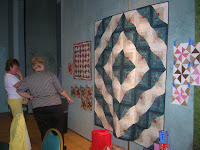 It was featured in the Quilt Sampler magazine in the Fall. Other featured shops that I have visited have been a disappointment on the whole but not this one. It is a lovely shop with wonderful samples, excellent lighting, lots and lots and lots of fabric..another good one to be far away from!! 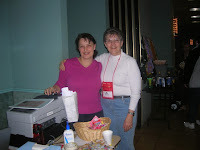 The ladies in the pictures are Sandy Perdue-the owner of the shop and Sue Elliott (I think that is her last name). Both were warm and friendly and always helpful. I did some damage here too and captured it on film. I bought a shirt, fat quarter pack and some fat quarters. As I was leaving I saw this wonderful sample made with Portabello mushroom. It was a 1-800-gotta have but they didn't have the book-they would bring it out to the retreat...now I have another project to complete. The weather in Florida-in a word- cold. For the most part, the sun was shining. It was mostly in the 50's and 60's. 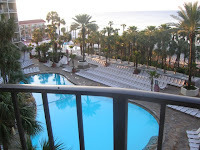 On Tuesday arrival, we checked into the Holiday Inn Sunspree Resort-go Intercontinental Hotels! 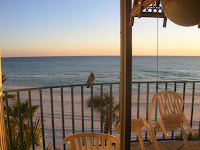 All of the rooms look out on the Gulf and overlook the pools, etc. It was quite nice. I set up my sewing machine on the table by the window and had a great view for sewing. Since it is off season, the hotel was only half full and one night in the restaurant, we were the only ones...talk about service! 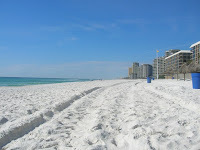 After settling in, I went to look for the retreat hotel down the beach. According to the address, it was about a mile away. The hotel looked like it was closed! I called the shop and sure enough, while the retreat would be held in the conference center, we were staying next door at the Days Inn. And it was quite a let down after the Holiday Inn. Ever go to a hotel and not want to get into the shower? Yup, you got it. I think this hotel suffers from the ravages of Spring break. I can't believe that I am already back at home...and thank goodness I have another day off before I go back to work. I have to upload pictures to the computer, so that I can post them on the blog but that will be later. 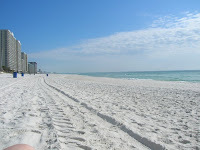 Peggy and I left on Tuesday morning for Panama City Beach and the quilt retreat. On the way down, we stopped at a GREAT quilt shop outside of Columbus, Ga. It is a good thing that it is a far piece! Shop is called Sew Much Fun and I must say it is worth a road trip! We both did some damage at the shop before getting on the road again. Alabama portion of the trip is long and boring-not much to see. That is all for now-I need to upload some shots and make nice to the guys...they are not at all happy with me right now!